Objective To evaluate the efficacy of hands and knees position and pelvic rocking exercises on the incidence of fetal occiput posterior position at birth. Design Multicentre randomised controlled trial. Setting Seven maternity units in New South Wales, Australia, encompassing teaching hospitals and district general hospitals. Participants 2547 pregnant women at 37 weeks' gestation; 1292 randomised to the intervention group and 1255 to the control group. Intervention Hands and knees position and pelvic rocking exercises from 37 weeks' gestation until the onset of labour. Main outcome measure Incidence of fetal occiput posterior position at birth. Results 1046 women in the intervention group and 1209 women in the control group remained in the study until they went into labour. No significant difference existed between the groups for the incidence of occiput posterior position at birth: 105 (8.1%) women in the intervention group and 98 (7.8%) in the control group had a baby in a posterior position at delivery (difference in risk 0.3%, 95% confidence interval −1.8 to 2.4). The incidence of fetal transverse arrest was 3.4% (44 women) in the intervention group and 3.0% (38 women) in the control group (difference in risk 0.4, −1 to 1.7). No differences occurred between intervention and control groups for induction of labour, use of epidural, duration of labour, mode of delivery, use of episiotomy, or Apgar score. Conclusion Hands and knees exercise with pelvic rocking from 37 weeks' gestation to the onset of labour did not reduce the incidence of persistent occiput posterior position at birth. Puddicombe first introduced the maternal hands and knees exercise as a way of facilitating fetal rotation antenatally in 1958.8 Subsequent authors have recommended the use of the hands and knees exercise as the optimal method of facilitating anterior fetal rotation.9–11 Studies in this area have been small, underpowered, and usually dependent on clinical palpation for the antenatal determination of fetal position. This has left them open to observer bias. A systematic review stressed that the hands and knees exercise cannot be recommended as an intervention until substantive evidence of its effect is available.12 The authors recommended that a randomised controlled trial should be conducted to guide clinical practice. Despite limited evidence of a beneficial effect, the hands and knees exercise has been adopted in many maternity facilities in Australia. We sought to assess the efficacy of this intervention in decreasing the incidence of persistent fetal occiput posterior position at delivery. This randomised controlled trial took place between 1999 and 2001 in seven hospitals in New South Wales, Australia, encompassing university and district hospitals. Women were eligible to participate in the study if they had a single fetus and were not booked for elective caesarean section. Eligible women were approached at 36-37 weeks of gestation and given verbal and written information about the study before enrolment. All women who agreed to participate gave fully informed consent before randomisation. We calculated gestational age by using the best available data from the last menstrual period and early ultrasound scan. No ultrasonography was done specifically for the purposes of this study. The midwife or the research assistants invited eligible women to participate. We designed the study to have an 80% power to detect a clinically significant 50% reduction in fetal occiput posterior position at delivery from 5% to 2.5% by using a two sided method with α set at 0.05. The calculated sample size was 1968. To compensate for an anticipated loss of 20% through non-adherence and losses to follow up, we increased the sample size estimate by 25% to 2460. We randomly assigned the study population to the intervention group or control group. We generated permutated blocks of size four for each participating hospital. We used separate allocation schedules for each hospital; each schedule had the same allocation ratio of 1:1. We did this to ensure comparability of the two study groups with regard to the mix of women coming into the trial from the various clinics and to minimise the impact of differences in the treatment patterns from clinic to clinic. The National Health and Medical Research Council Clinical Trial Centre generated the random allocation sequence. We assigned participants to the appropriate groups by a telephone call to the randomisation centre. Because of the nature of the intervention, participants were not blinded. Although midwives who documented fetal position at birth and entered it into the hospital's obstetrics database could become aware of group allocation, this would not affect the objective outcome. The research assistants collecting and entering data were blinded to group allocation. The intervention group used a hands and knees position with slow pelvic rocking exercises for 10 minutes twice daily, beginning in the 37th week of gestation and continuing until the time of labour. At recruitment and before randomisation we informed women that this study was to examine the impact of exercise on fetal occiput posterior position. After randomisation we informed the women in the intervention group of the potential effect of the hands and knees exercise. Women in the experimental group received formal instruction on how to do the exercises from a midwife or research assistant. We standardised the instruction of midwives through the use of a videotape presentation. In addition, the women in the intervention group received an instruction pamphlet to use at home. Women in the control group were asked to do a routine exercise of daily walking. Both groups received a diary in which to record any daily exercises or activities such as walking or swimming. In addition, we asked the intervention group to document daily information on hands and knees exercises. To minimise potential contamination of the control group, we asked participants to refrain from discussing the exercise regimen with other pregnant women. We compared the two groups for the incidence of persistent fetal occiput posterior position at birth. We considered persistent occiput posterior position to be present when the fetus was delivered spontaneously in a posterior position or was rotated manually or instrumentally from occiput posterior to an occiput anterior position before delivery. We also requested obstetricians to record the position of the fetal head at emergency caesarean section of those study participants who had this mode of delivery. We considered transverse arrest to be present when forceps or vacuum delivery was used to rotate the fetus from a transverse position before delivery or where caesarean section was done at or near full dilatation for failure to progress with the baby in an occiput transverse position. The midwife or delivering doctor recorded the position at birth on a study sheet, which was later cross referenced with the medical record. We also collected data on some secondary outcomes, including induction of labour, use of epidural, mode of delivery, duration of labour, use of episiotomy, and Apgar score. We entered data into a database by using double data entry and analysed them after quality control checks. The analysis involved a comparison of the incidence rates of persistent fetal occiput posterior position in the intervention and control groups. We established statistical significance by means of a χ2 test and calculated confidence intervals. We considered characteristics that were significantly associated with outcome variables (P < 0.05) in the univariate analysis to be potential confounding factors and included them in a logistic regression model. We did the primary analysis by intention to treat. Over three years we randomised 2547 women, of whom 1292 were assigned to the intervention group and 1255 to the control group. The figure shows the flow of participants through the various stages of the trial. 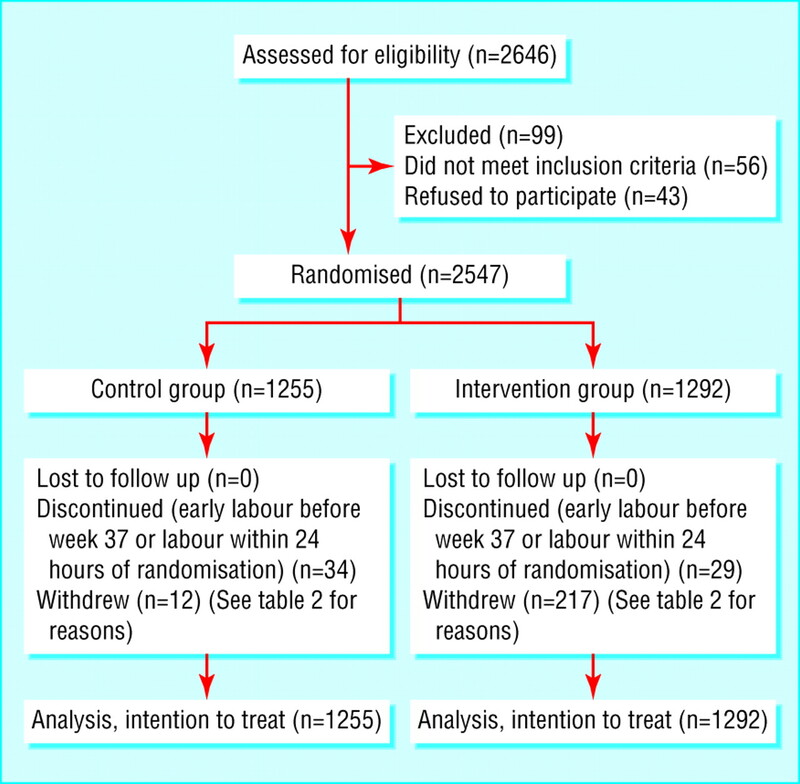 Twenty nine (2%) women from the intervention group and 34 (3%) from the control group had a spontaneous onset of labour before 37 weeks of gestation or entered labour within 24 hours of randomisation. During the study period 217 (17%) women withdrew from the intervention group and 12 (1%) from the control group. Table 1 shows the baseline characteristics of the two groups. The groups were comparable in terms of age, weight, body mass index, height, marital status, occupation, and parity. Most women (72% in both groups) were born in Australia; the distribution of other countries of birth was similar in the two groups. The baseline characteristics of the women who withdrew were comparable to those of all participants. Women withdrew from the study groups for a variety of reasons (table 2). We included all randomised women in the analysis. A persistent fetal occiput posterior position was recorded in 105 (8.1%) women in the intervention group and 98 (7.8%) in the control group (table 3). This difference was not statistically significant (difference in risk 0.3%, 95% confidence interval −1.8% to 2.4%). The incidence of transverse arrest was also similar: 44 (3.4%) in the intervention group and 38 (3.0%) in the control group. Even after exclusion of women who withdrew from the study or had early labour, the incidence of persistent occiput posterior position was 7.8% (82/1046) in the intervention group and 7.9% (96/1209) in the control group. The incidence of transverse arrest was then 3.3% (35/1046) for the intervention group and 3.1% (38/1209) for the control group. We also examined the effect of hands and knees exercise on the position of the fetus with adjustment for parity, as parity has been reported as a risk factor for occiput posterior position.6 In a univariate analysis, we found that nulliparity was associated with an increased risk of occiput posterior position at birth (odds ratio 2.5, 95% confidence interval 1.9 to 3.3). Even after adjustment for parity, hands and knees exercise showed no effect on the position of the baby (odds ratio 0.94, 0.73 to 1.21). We found no significant interaction between parity and exercise. We found no differences between the intervention and control groups in induction of labour, use of epidural, duration of labour, mode of delivery, use of episiotomy, or Apgar score (table 3). Of 1046 women in the intervention group who remained in the study until the onset of labour, 371 (36%) did the exercise between 15 and 28 times, 364 (35%) did it 29-42 times, and 122 (12%) did it 43 times or more. Most of the women who did the exercise least often did so because they delivered between 37 and 40 weeks rather than because of non-compliance with the protocol. Of the 217 women who withdrew from the study, most (139, 64%) did the exercise between 1 and 14 times before withdrawal. Twelve (6%) women did the exercise 15-28 times, and only 2 (1%) women did the exercise between 29 and 42 times. In addition to these 217 women, 29 women had a spontaneous onset of labour before 37 weeks or within 24 hours of randomisation without starting hands and knees exercise. When we examined the exercise log of the women in the control group who remained in the study, a small proportion (8; 0.7%) had also done hands and knees exercises more than 15 times. A further 18 (2%) women had done the exercise 1-14 times before going into labour. We reanalysed the data taking into account the number of times the women did the hands and knees exercise. Again, we found no effect of the level of exercise on the incidence of occiput posterior position at birth. Pregnant women are often advised by their midwives to use exercise to facilitate the anterior rotation of the fetus. However, this advice is mainly based on personal belief. Research evidence to support this practice is limited. In a systematic review of this intervention published in 2002, only a single study was of sufficient quality to be included.12 The authors of this review concluded that insufficient evidence existed to support the use of this intervention and recommended that a randomised controlled trial should be done to guide clinical practice. However, hands and knees posturing with pelvic rocking remains a widely used intervention in midwifery practice. Indeed, several of the hospitals that we approached to participate in this study refused because they thought that it would be unethical to deny women access to this intervention. In our multicentre randomised controlled trial hands and knees position with slow pelvic rocking during the last few weeks of pregnancy did not reduce the number of babies with persistent occiput posterior position at birth. The calculated difference in risk (0.3%) between the two groups was clinically insignificant. The confidence intervals show that at most the exercise might decrease the incidence of occiput posterior position by up to 1.8% or increase it by up to 2.4%. We found no difference between the intervention and control groups for induction of labour, use of epidural, duration of labour, mode of delivery, episiotomy rates, or Apgar scores. Because most of the withdrawals occurred in the intervention group, this could have left the study slightly underpowered to detect a significant reduction in occiput posterior position. This was not the case, however, because the observed rate in the study population was more than 8% and power calculations were based on an expected rate of 5%. Gardberg et al found that 68% of fetuses presenting as occiput posterior position at birth resulted from a malrotation from an initial occiput anterior position.3 Fetal position in this study was identified through ultrasonography at the onset of labour. Persistent occiput posterior position was more common if the fetus was occiput posterior at the onset of labour, but this group accounted for only 32% of all occiput posterior babies at delivery. If these results are correct then hands and knees posturing for fetal rotation would not be beneficial before the start of labour in two thirds of women. We did not investigate whether or not posterior babies in our study developed through an intrapartum malrotation or through absence of rotation from a pre-existing occiput posterior position. In our trial we asked women to do the hands and knees exercise for 10 minutes twice daily. We chose this level of exercise after surveying the advice given by midwives to mothers in the clinics used in the study. Though not all women adhered to the protocol, previous studies reported rotation to an anterior position after a single episode of 10 minutes of hands and knees exercise. Most women in our intervention group did the exercise at least once a day between randomisation and delivery. Identification of interventions currently used in practice that do not have a beneficial effect on outcome is important. Women who are advised to do these exercises to help to rotate the baby may feel a sense of failure or shame if they do not follow that advice. They may also find their confidence in their care giver diminished if they follow the advice but the expected outcome does not occur. Moreover, hands and knees exercise in late pregnancy can be quite uncomfortable; this was one reason for withdrawal from the study group. In the absence of any proved benefit, these potential adverse effects become more important. Hands and knees posturing with pelvic rocking exercise for achieving spontaneous rotation from occiput posterior to occiput anterior position is a common midwifery practice. This multicentre randomised controlled trial did not support the effectiveness of this intervention. Given the study design involving seven different units, these results would probably be applicable to other populations. Therefore, in the absence of evidence of a beneficial effect, we would suggest that this advice should be discontinued, at least as a way of changing the fetal position. We thank the patients and the secretarial and medical staff of the participating hospitals. We also thank Di Wilton for help in recruitment and in collecting and entering the data, the midwives for their support, Alan Brnabic for his help with the analyses, and Jack Cheng for his advise on our database. Contributors: AK was involved in study design, project management, recruitment, statistical analysis, and writing and redrafting the paper. MC was involved in study conception and design, project management, and writing and redrafting the paper. JK was involved in study design, project management, statistical analysis, and writing and redrafting the paper. AS was involved in recruitment, data collection, and review of the original paper. AK is the guarantor. Ethical approval Ethical approval was obtained from all participating hospital ethics committees before the study started.
. The management of persistent occiput-posterior position. Clin Exp Obstet Gynecol 1995; 22: 126–31.
. Williams obstetrics. 20th ed. Stamford, CT: Appleton and Lange,.
. Intrapartum sonography and persistent occiput posterior position: a study of 408 deliveries. Obstet Gynecol 1998; 91: 746–9. Royal North Shore Hospital 1996 labour ward statistics, ninth annual report. Sydney: Royal North Shore Hospital, 1997.
. Vaginal delivery from the persistent occiput posterior position: influence on maternal and neonatal morbidity. J Reprod Med 1993; 38: 955–61.
. Influence of persistent occiput posterior position on delivery outcome. Obstet Gynecol 2001; 98: 1027–31.
. Intrapartum risk factors for newborn encephalopathy: the Western Australian case-control study. BMJ 1998; 317: 1554–8.
. Maternal posture for correction of posterior fetal position. International College of Surgeons 1958; 23: 73–7.
. Nursing intervention to change a malpositioned fetus. J Adv Nurs 1981; 3: 53–6.
. Nursing, maternal postures, and fetal position. Nurs Res 1983; 32: 336–41.
. The patient observer: does the hands-and-knees posture during labour help to rotate the occiput posterior fetus? Birth 1991; 18: 40–7.
. Hands/knees posture in late pregnancy or labour for fetal malposition (lateral or posterior). Cochrane Database Syst Rev 2002;(4): CD0010163.
. New South Wales mothers and babies 2000. Sydney: New South Wales Department of Health, 2001.
. Maternal and fetal prognosis of occiput posterior presentation. J Gynecol Obstet Biol Reprod 1999; 28: 41–7.